In recognition of a world leader who has excelled in dedicating oneself to promoting peace and has outstanding contributions to love and cultural exchange, and to encourage compassion in people and bring them together to strive for the urgency and necessity of global solidarity and world peace. Through this award with which to unify those around the world with this responsibility and commitment, mankind can not only enjoy the rich fruits of culture and technology, but also a new century filled with love and peace. In recognition of a leader who, emulating the trend of the world, has excelled in dedicating oneself to promoting love and a culture of peace throughout the world and through one's actions, has brought together people who believe that a culture of peace is the foundation to a future of peace. This leader, starting with oneself, has influenced others to have heart-filled respect for the world in which we live. The purpose of presenting the "World Peace Culture Award" is to raise awareness of the work of the award recipient, and to foster an understanding of a culture of peace and to instill in others "a heart filled with love and peace." His Excellency Mr. Anthony Thomas Aquinas Carmona has built a successful career as a distinguished legal expert serving as a judge of the International Criminal Court and the fifth President of Trinidad and Tobago. In his diverse roles and capacities, he has strongly advocated peace, justice and human rights for all. He has also demonstrated his attention to the many problems we face today as one human race, including combating climate change as well as educating and empowering marginalized groups and individuals. He has admirably leveraged his influence to build a peace culture through his inspirational speeches and actions. Dr. Hong presented the World Peace Culture Award to H.R.H. Prince Khalifa bin Salman Al Khalifa in recognition of his dedication in the past half century to cultural heritage conservations, promoting stability and harmony among the communities, and taking the lead in establishing the financial and harmonious cultural center in Arab region. The award was received by H.E. Shaikh Hussam Bin Isa Al Khalifa, the president of the prime minister’s court, on behalf of the H.R.H Prince Khalifa bin Salman Al Khalifa. In recognition of one who has continued and dedicated oneself to promoting peace education, and who has brought people around the world together to promote global peace education, which has led to increased health and well-being for mankind. The purpose of presenting the "World Peace Education Award" is to raise awareness of the work of the award recipient, and through the means of education, to instill in humanity respect for one another's culture, to reduce conflicts, and to cherish even more the world in which we live. In recognition of one who has selflessly dedicated one's life to promoting international peace, and through love and peace, has inspired others to cherish nature and respect the laws of nature, and to live life genuinely. Furthermore, this person has inspired others to strive together for global solidarity and promoting world peace. The purpose of presenting the "The Lifetime Achievement Award of Love and Peace" is to raise awareness of the work of the award recipient, as well as to encourage more and more people to devote their lives' best efforts towards cherishing the earth and contribute to the well-being of mankind. Since 1969, Queen Mother Dr. Delois Blakely has engaged in cross-cultural and multi-ethnic programs to facilitate understandings, bridge cultural gaps and foster community supports to solve problems of racism, poverty and ignorance. She has set a new paradigm of how conscience, love for the world and peace can be put together to educate, inspire and lead people towards a better and more just world. 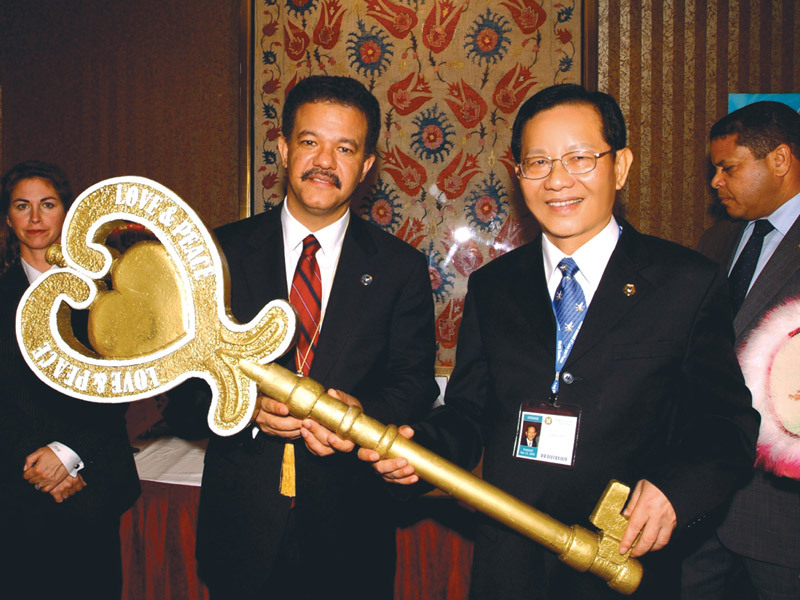 ​On September 15, 2005, Dr. Hong and President Leonel Fernández Reyna of the Dominican Republic jointly turned the Symbolic Key of the World, proclaiming September 15 of each year the “International Love and Peace Day.” They also co-signed the Declaration of International Love and Peace Day to encourage heads of state and government to take actions for a world of love and peace.